The Coal Mines are the extensive cave system in the small mountain at Moleville. 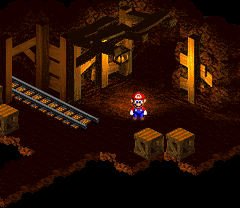 In Super Mario RPG: Legend of the Seven Stars, Mario, Mallow, and Geno (and coincidentally Bowser) visit Moleville on their respective journeys. Inside the cave, there is a mine cart minigame and Punchinello, the guardian of the third Star Piece. To the east is Rose Town and to the west is Marrymore. Mole men work in the mines, extracting coal. This page was last edited on March 5, 2019, at 14:56.